Posted on October 13, 2015 by Appropos / This entry was posted in Informative and tagged dab rig, dabbing, nails, oil rig, rig, vaping. Bookmark the permalink. Of all great inquiries in modern history, none is more confusion laden than that regarding concentrate nails. When presented with all the different nail options, one might find themselves a bit overwhelmed. Terms like male and female, adjustable and fixed, dome and domeless can lead to some serious head-scratching. 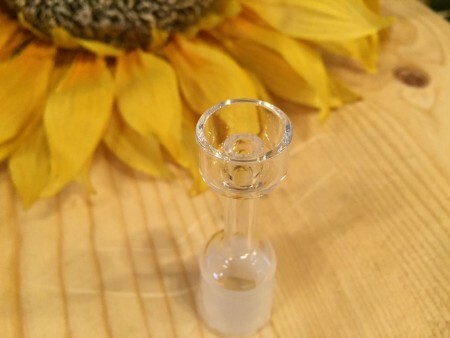 Today, we at Sunflower Pipes present you with a comprehensive guide to understanding concentrate nails, listing the pros and cons of each material and the proper way to use each type. What Is A Concentrate Nail? Nails are small pieces of glass, ceramic, or metal that sit on or within a fitting attached to a rig. Nails are heated either by a torch or through electrical means, and then make contact with concentrate waxes to produce a vapor. Traditionally, nails are covered by a glass dome to prevent vapor from escaping while one draws the vapor through a rig. There are also domeless nails, which combine the nail and dome into a single piece. Domeless nails have shallow troughs surrounding a central opening. This keeps the vapor localized while reducing user interaction. Dome or Domeless? An old question without answer. At its core, it truly comes down to a matter of preference. A traditional concentrate nail will typically sit on or within a joint depending on type. 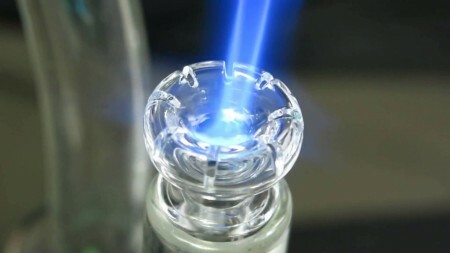 The nail is heated and a glass dome is placed over the nail to prevent vapor from escaping whilst drawing from your rig. Domes are typically made of transparent borosilicate glass but heady custom-made almost sculpture-like domes by glassblowing artists are also very popular. Dome and nail set-ups are the evolution of your more primitive titanium swing set-ups. That evolution is continued through the invention of domeless nails. They are engineered to have identical (if not superior) function to the traditional dome and nail set-up. Domes can often become hot after consecutive uses and can also easily become dirty because of sticky residual mess. We can thank the ever-expanding culture for these great advancements in concentrate accessories. Only recently has so much discussion in the differences in joint styles come to a rise. I would attribute this to the growth of the concentrate community and the evolution of concentrate accessories. A product of this evolution was the rise of male joints on water pipes, which have recently been replacing traditional old-school slides. As a general rule of thumb, most water pipes/bongs are going to be female in nature, meaning a device, usually a downstem or bowl, goes inside the pipe, whereas a concentrate pipe usually has a male fitting that can be probed by a nail and fitted with a dome. Out of all 3 materials, Quartz has the fastest heating time at 5 – 10 seconds. Quartz nails have a very low heat retention rate, which means they will cool faster than their titanium or ceramic counterparts. Quartz is in fact food/medical grade, which means it will not emit any harmful toxic gases when heated. Quartz is breakable; one good knock can call for a replacement. Quartz can also accumulate stress through heat & eventually crack or break. Ceramic nails have the longest heating time of all 3 materials at 30+ seconds. What they lack in heating time, they compensate for in heat retention. Ceramic nails have the longest heat retention factor of all 3 materials. The ceramic used to make concentrate nails is food and medical grade making it safe to heat and use. Ceramic, much like quartz, is not immune to heat-stress and can break with enough forceful impact. However, they are more durable than quartz nails in general. Titanium takes a relatively short amount of time to heat, at 15 – 25 seconds. Titanium has a great heat retention factor, right behind Ceramic nails. Titanium is not graded on a Food/Medical grade scale but by Titanium standards. Most nails will typically be Grade 2 Titanium which is safe but will need to be seasoned before use to avoid inhalation of any harmful metal finishes. Titanium nails are tough as nails. They will never show wear of heat-stress and will not be broken unless placed under EXTREME pressure. No need for replacements. The nail you choose will be largely determined on your rig or pipe. 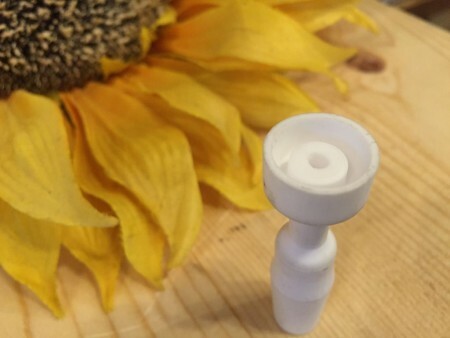 Water pipes and oil rigs come with fittings ranging from 10mm to 18mm. Most water pipes have a female fitting, which is great for slides and downstems but most oil rigs have a male fitting which is better equipped for holding a nail and sliding a female fitted dome over. It is easy to find a nail to fit any of the standard fitting sizes. 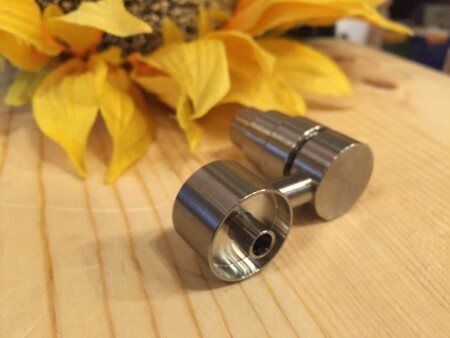 But there are also adjustable nails and universal domeless nails which are able to fit multiple fitting sizes and are great for those who have multiple rigs as well as those looking to convert a water pipe into an oil rig. To dab or not to dab is no longer the question. The question now being, at which temperature should we dab? There are a few different temperature levels to choose from. Low Temp vaping is when you vaporize your extract at a lower temperature and cover the heating source with a carb cap while inhaling. This results in a convection process trapping heat like in the same fashion that a dutch oven does. This method of vaporizing heats concentrates that would not normally have a chance to reach high enough temperature to be effective, leading to more powerful, flavorful dabs. 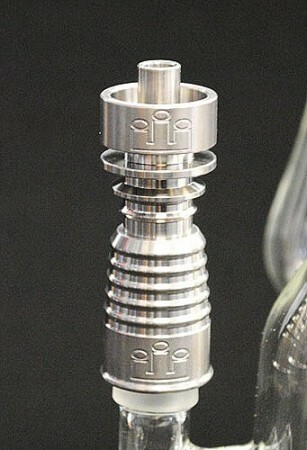 A carb cap is a covering for a dome or domeless nail which is often attached to a dabbing stick. The cap has a small hole, or holes, that allow airflow to enter while the heat within the dome is trapped. 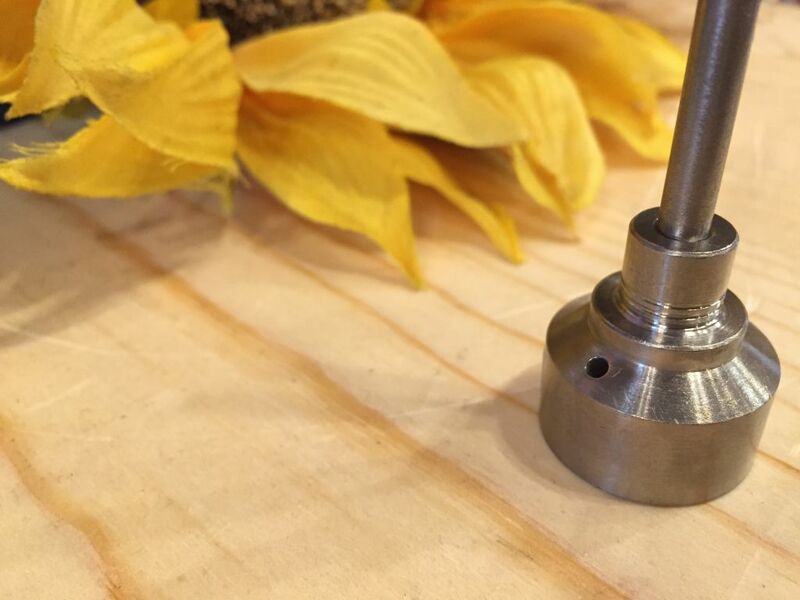 The carb cap goes over the dome after the nail has been heated, cooled, and rubbed with concentrate. Via this method a nail can be cooled for anywhere from 5-30 seconds. If done correctly the concentrate on the nail will sizzle and fill the chamber with a nice milky vapor. Utilizing this method of concentrate vaping provides increased flavor and less concentrate is disintegrated at the beginning of the vapor process, which means less money spent. Some have even claimed that some of the molecules in extracts are broken down with Low Temp instead of being instantly burned away, resulting in longer-lasting, more intense effects. Most oil rigs require a torch for heating the nail with. This has been a great, practical technique thus far, but innovation in the field has led to electrical methods capable of achieving the same effect. Electric nails are often metal boxes with a port for a coil, a switch, and a display that gauges the temperature of the coil. While most E-Nail models will require an additional power source, some models are now battery operated with portability in mind. Electric heating methods provide various health and efficiency benefits. With electric nails it is much easier to ensure that you are always vaporizing at the optimal temperature. Through their precise temperature measuring systems they provide on point temperature levels avoiding a torches potential for overheating your nail and burning your extract. This process is most specifically associated with titanium nails. Seasoning your nail removes polishes and top coats created through the manufacturing process of the nail. Without properly seasoning a new titanium nail, your essential oil might have a slightly metallic taste. It’s the same principle as cast iron pans. If you cook on an unseasoned cast iron pan, your food is going to taste funky. Place your nail on the joint of your rig. Take your torch (preferably butane) and evenly heat up the titanium until it turns red hot. Using a spray bottle, douse your nail in cold water. Allow nail to cool down a little bit. Repeat Steps 2 & 3, three to five times. Place your nail in a bowl or container. Pour 91% isopropyl alcohol into the bowl until your nail is fully submerged. Allow to sit for 30 minutes – 1 hour. With the information in this article you will be well on your way to an enjoyable dabbing experience. There are many techniques and temperatures to experiment with. By following the information in this article you will have a firm foundation to build upon. Dabbing is still relatively new. There are many devices and accessories being released which are steering the art of dabbing in creative new directions. So have fun, be safe, and dab on you crazy diamonds.